English is an international language, and ‘everybody’ can understand it, right? Wrong! And so the DilemmaMatch development team wants to make it as easy as possible for everybody to understand the Dilemmas. 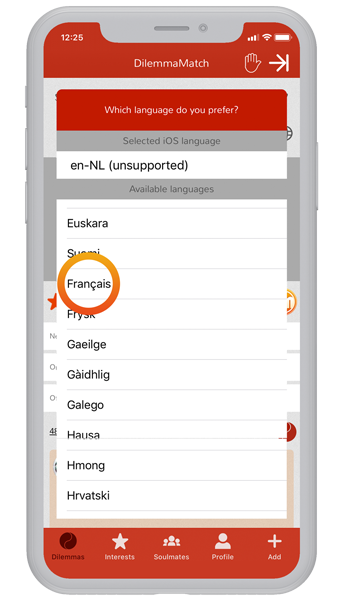 In the latest release we've added the option to translate each Dilemma into your preferred language! When you are in the ‘Answer Dilemma’ screen (or My Answer/My Dilemma screen), tap on the small icon. The first time you can choose your language, and the Dilemma (Title, Description and the answers/options) will be translated into that language. Simple as that. If you tap a second time, the Dilemma returns to the original language (English). 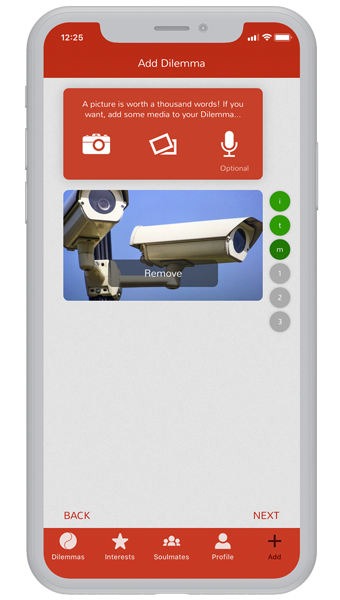 On any new Dilemma screen one tap on the icon, and the Dilemma will be translated - like magic! See the FAQ page for more info on selecting and changing your preferred language. We didn't stop with the new ‘Translate’ feature. We want to improve the DilemmaMatch experience whenever we can, which is why we completely redesigned the way you create your own Dilemma(s). In a few snappy ‘moves’ you can add your own Dilemma, add media, and immediately start finding out what people all over the world think. See how you match with them in your Soulmates screen. You can check out the changelog for an update on all the features in this, and previous DilemmaMatch releases, either on this site, or in the DilemmaMatch settings screen. So why wait, download version 1.2.0 for iOS and Android now! Entertainment & Media, Business & Finance, or News & Politics? Choose Dilemmas that interest you! Dilemmas are grouped into 10 categories, and the number after each Interest indicates how many Dilemmas you haven’t answered. Like Fashion & Lifestyle more than History & Culture? Drag the ‘Interest’ into the order you prefer on the Interests screen! This will influence the Dilemmas you will see… and make finding like-minded friends even easier. Each and every person sees the world differently and from a different angle. People have different beliefs, hobbies and opinions. Imagine you could find people, who think like you and share your interests. By answering Dilemmas, or even adding your own, the DilemmaMatch app will link you with these people anywhere in the world! Tap the Interest title in the Dilemma screen to choose only Dilemmas from the same category. Check out the ‘Popularity’ of each Dilemma using the symbol shown with each Dilemma. View the latest Dilemma. Find people who are interested in the same things - who think the same as you. People with the same or similar answers will be shown in your list of ‘Soulmates’. You can also visit the Profile page of the author of each Dilemma by tapping on the name and find out how well you match with the person behind the Dilemma. The higher they score the better the match. Want to see how well you match with your Facebook™ friends? Want to compare yourself with the top 10 Dilemma Creators? Well you can. Swipe in the Soulmates screen (iOS) or choose the menu in the Soulmates screen (Android) to see just how well you match with your Facebook™ friends. They just need to install the DilemmaMatch app, login with their Facebook™ account, and answer Dilemmas. What could be easier? Not happy with the choices on offer? Or just want to explain how you think? You can give other users a hint of what motivated your answer, and help them to appreciate your point-of-view by adding motivations. And if you see motivations that you like, just tap to like them! Help others to appreciate your point-of-view and fast track your search for new friends. When viewing Dilemmas, your own motivations are shown first, followed by any other motivations (with the most liked at the top). If you wish you can add more than one motivation when viewing the Dilemma from the ‘My Answers’ page in your Profile screen. Find an interesting Dilemma? Want to share it with your Facebook friends? No problem! Let your Facebook friends know about the Dilemmas you like or created! You can share a Dilemma with a single tap, and friends on Facebook can view the Dilemma from your Facebook page. Have a personal Dilemma or full of ideas? By adding your own Dilemma you will find out what others think - and it might help you! 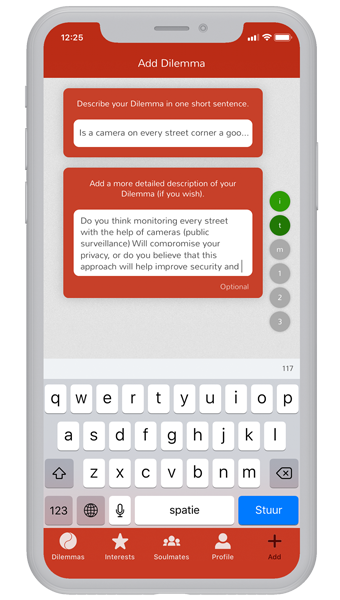 After all, a problem shared is a problem halved (or so they say), so upgrade the DilemmaMatch app to the Premium version, and feel free to add as many Dilemmas as you want! View the differences between the Free and Premium version of DilemmaMatch. No need to create a new profile: DilemmaMatch does it for you! DilemmaMatch is linked to Facebook, so your basic information is taken directly from your Facebook Profile, and updated every time you make a change. View your 'Profile' in the DilemmaMatch app, as well as those of your (new) friends! Want to know how other DilemmaMatch app users answered your Dilemma? With the Premium version you can see people's choices and motivations for your Dilemmas, and see how often they have been answered. You can also review your own answers from your Profile page. Gave the wrong answer? Changed your mind? You can delete answers from the 'My Answers' list in your Profile screen. You can earn more than 60 unique badges by answering questions, creating Dilemmas, setting your favorite Interests, adding motivations and more - including launching DilemmaMatch. To find out more about the available badges, take a look.